Each individual piece of workmanship requires painstaking attention to detail and design in the process of its creation. When shopping in Chiang Mai, one must consider the many handicrafts that are part of the city's history. Made with workmanship skills that have been passed down from generation to generation, these beautiful crafts are a good representation of Chiang Mai's proud Lanna heritage. Umbrellas made of sa paper, hilltribe crafts with bold colors, fabrics of countless types, delicate ceramics (celadons), replicated and genuine antiques, dazzling jewelry and gems, silverware of all sorts, lacquers with intricate designs, rattan and wickerwork, and woodcarvings ranging from pictures to furniture are only a part of the long list of crafts and arts that help to make Chiang Mai so special. Owning one of Chiang Mai's traditional crafts is a sure way to take back tangible memories of your visit to Chiang Mai. Although modern technology had been introduced, Chiang Mai silk remains a timeless expression of the craftsman's skill. From reeling the gossamer silk filaments from the cocoon, through the dyeing process, to weaving the filaments into a myriad of shimmering forms, nothing can replace the sure hands and eyes of the experienced craftsman in revealing the luminous beauty of genuine Thai Silk. Skill and experience on the part of the craftsman are paramount for the process. Producing Celadon requires a great deal of time, care and concentration. 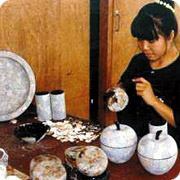 Chiang Mai is the centre of Thailand's ceramics industry. Among it most prized items is the distinctive Celadon pottery, so named for its unique glaze, the result of certain ingredients mixed with wood and ashes applied in a carefully controlled step by step process. The clay is first treated with additives which are then let in the shade and thrown. After bisque firing at a temperature of 800 C, the glaze is applied. The piece is then placed in the kiln for a second firing at a temperature of 1,250 C, which gives the Celadon its inimitable, finely cracked finish. Both silver coins and pure silver ingots (smelted in a furnace) are beaten out by hand into the desired style or shape. Months of patient effort go into these delicate and intricate designs. Chiang Mai offers a wide selection of modern and antique silverware. The city is a prime source of such objets d'art because generations of artisans have made their homes here. Chiang Mai's laid back atmosphere has brought together many ethnic groups, each with its own distinctive style, providing you with a wide range of beautiful artifacts to choose from. The majority of the best silver works are situated along the Chiangmai - Sankampeang Road. Here you will find delicately patterned silverware from Thailand, Laos and Burma along with antique and modern hilltribe jewelry. The art of making lacquerware is a 400 year old Chiang Mai tradition. Lacquerware is entirely handmade. Lac Resin is produced by insects from sap taken from fig trees. The exquisite oriental designs on the flawless glossy black surface are made entirely by hand. The world renowned Thai lacquerware can be decorated in paint, gold leaf, egg-shell or simply engraved. Cotton is the most common fibre used in weaving in Thailand, especially Chiang Mai grown cotton which is of two types: one which produces white tufts ad one which produces light brown tufts, the latter being known locally as "fai tun" or "moi rat cotton". Even though locally grown cotton gives a lower yield, has coarser threads an is light brown in colour rather than white, it has a special quality which makes it suitable for weaving textiles as it can be used in any season. It is cool in the summer and warm in the winter: as Chiang Mai people say, it breathes. Thai craftsmen have become experts in the art of making beautifully refined and elegant jewellery. Their expertise in the cutting, polishing and setting of gems is uncontested worldwide. If you're truly looking for a beautiful jewel, the Sankampaeng Road is a place to go. There you can admire the most somptuous assortment: glorious sapphires, diamonds, emeralds and Siamese Rubies in exclusive designs - with splendid collections of exceptional works of art: necklaces, bracelets, earrings, rings and bangles, especially created by the local artists. Chiang Mai is a major centre of wood furniture making, its artisans being well known for their expertise in woodcarving floral motifs and other intricate designs. Wood furniture in a variety of finishes, including a light withewash and pastel colours, include cabinets, tables, dinning room sets, bedroom sets or something as simple as a wood tray or trivet - indeed anything bearing a wood surface large enough to be carved. Carved wood elephants and wood figurines number among other popular purchases.